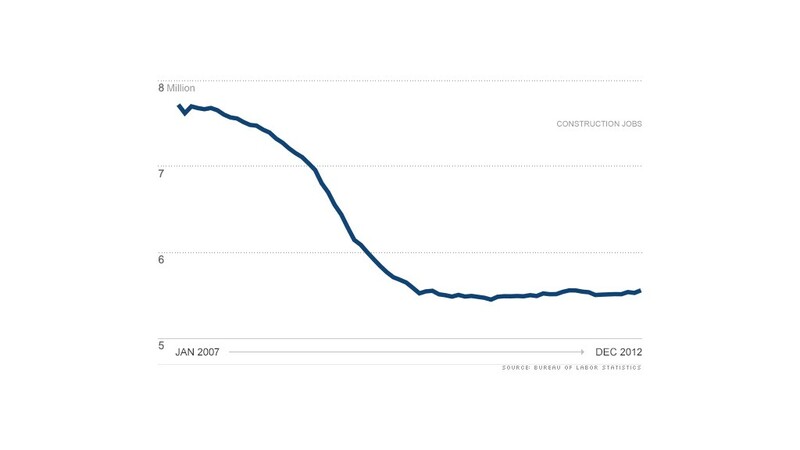 Of the 8.8 million jobs lost in the U.S. economy, a whopping 2.2 million were in construction. Most of those jobs have yet to come back. Some construction firms expect to hire more workers in 2013, but don't call it a comeback just yet. About 31% of construction companies plan to hire workers this year, while only 9% of firms plan to cut jobs. The others either expect to keep their staff levels the same, or aren't sure of their hiring plans yet, according to a survey by the Associated General Contractors of America. While the industry is still far from a hiring boom, it marks some improvement over a year earlier when 31% of firms planned to cut employees, nearly canceling out the 37% that planned to hire. "2013 should be a good year, but not a great year for most construction firms," said Ken Simonson, chief economist for the Associated General Contractors of America. In the survey of 1,300 firms, only 20% said they expect the overall construction market to grow in 2013, while 56% don't expect it to grow again until at least 2015. The construction industry was by far the hardest hit sector in the jobs crisis. Of the 8.8 million jobs lost in the U.S. economy, a whopping 2.2 million were in construction. Most of those jobs have yet to come back. Construction firms hired only 18,000 workers last year, and one in five construction laborers were unemployed, according to the Labor Department. Many of the gains have been confined to specific areas, like North Dakota and central Texas, where the shale gas industry has created demand for mining-related construction jobs. "We've seen a dramatic increase in the demand for labor," said Dean Word, partner at Dean Word Industries, a road building firm in New Braunfels, Texas. Firms there are looking for skilled pipeline welders, inspectors, excavators and commercial tanker drivers. "They're paying the premium prices for labor that will show up regularly and pass a drug test," Word said. That contrasts dramatically with regions still suffering from the fallout of the housing boom and bust. "Drive toward Sacramento, and it might remind you of the dust bowl," said John Nunan, president of Unger Construction in Sacramento, Calif. "Construction activity has ground to a halt." Did you switch from a construction or manufacturing job, to a role in a completely different sector? Send your story to annalyn.kurtz@turner.com.